This past weekend has been such a wonderful experience in my life. I had the opportunity to bring a dream alive, in partnership with over 200 incredible people, most of whom I had never met before. They included beautiful, fresh-faced young girls, inspiring cancer survivors, courageous men who made up the minority of the female dominated group-making their presence all the more special and heartfelt, teachers whose dedication to their job and their students is truly life-changing, families of 7 people, and women from all walks of life. Each person contributed something special. 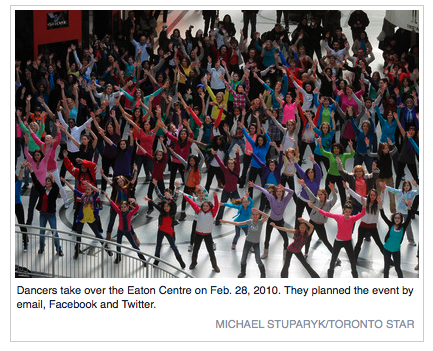 I am certain that my friend Erika was looking down from above, casting her radiant glow over the dancers in the Toronto Eaton Centre. I certainly felt her presence when the music started and my fellow-dream-makers broke out into dance. At just the right moment the sun burst through the atrium above-lighting up the dance floor and all the dancers on it. This event had so many of Erika’s favorite elements; children, friends, music, dancing and plenty of smiles. sheroes – they are standing right along side us-gently encouraging us, guiding us and demonstrating through their own example, how to live life with meaning and gratitude. It’s such a simple thing really, to tell the women who inspire us how we feel, but it is truly so powerful. That one simple gesture could change someone’s life forever-I know it changed mine. I look forward to hearing the stories of the amazing women you know. One person CAN make a difference…that person is YOU! I am so proud to have been a part of capturing this amazing event. It really is beautiful to see so many strangers come together to pay tribute to the wonderful women in their lives.